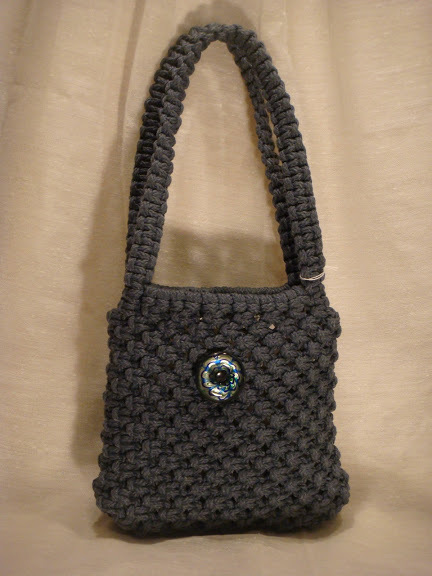 Here is a great “gotta run” purse. It incorporates an eight inch internal flex frame. 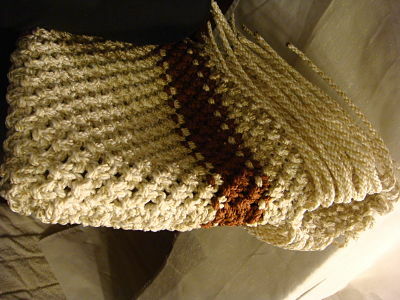 The cords are attached by using larks head knots onto the frame and tied from there. 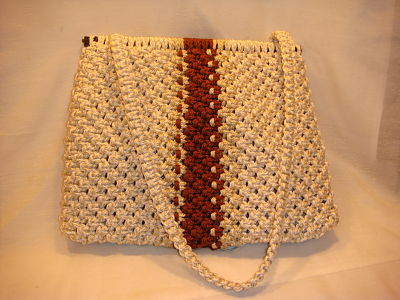 This purse uses about 54 yards of 4mm cord in three colors. 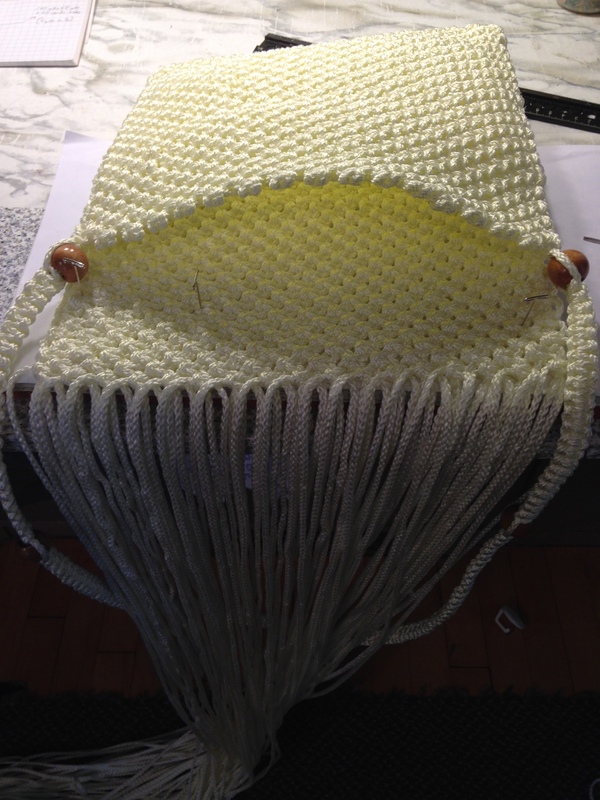 Here I am making another purse using a twelve inch frame and 189 yards of 6mm cord. 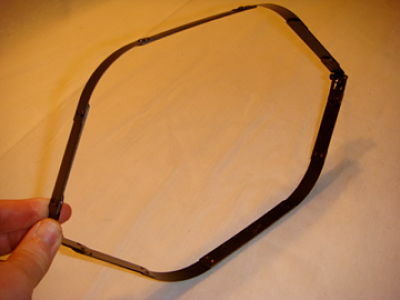 I find flex frames to be a popular style because of the frame closure; it stays open until you close it. 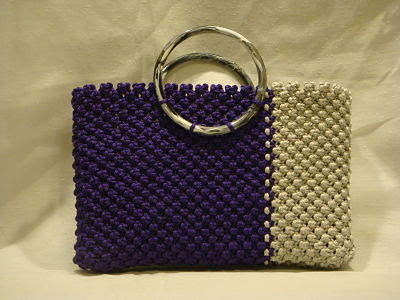 There are two changes in the original method to make this purse project easier. 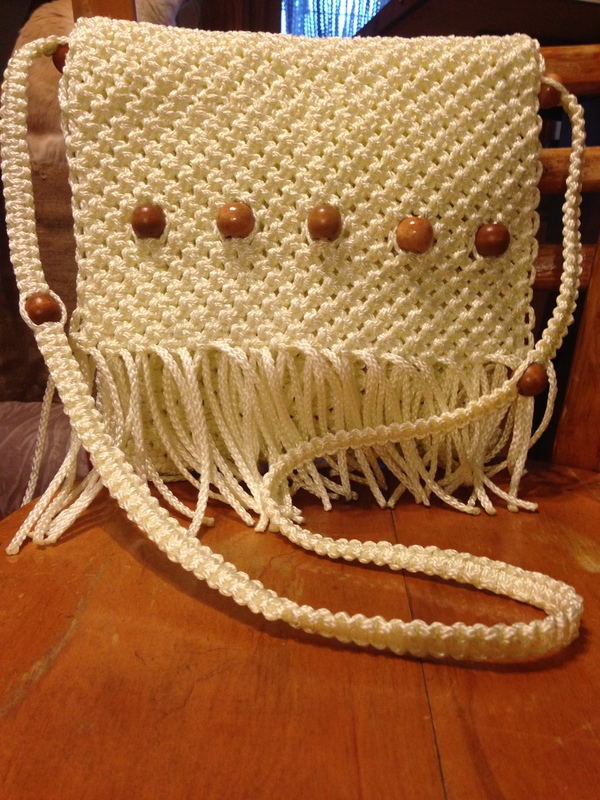 One thing I found difficulty was how to easily and quickly knot the purse once the cord was mounted onto the frame. 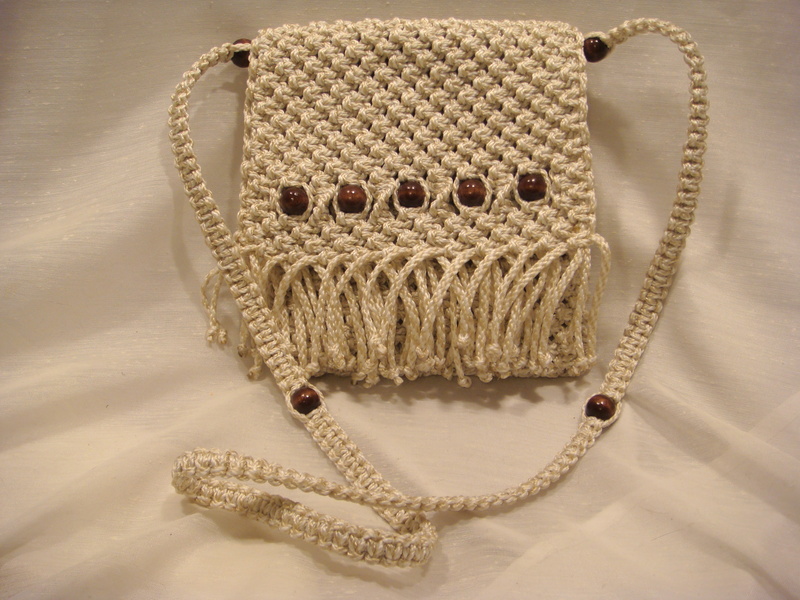 The other complication is in the closure at the bottom; the frame opening does not always allow you to pull the entire purse inside out. 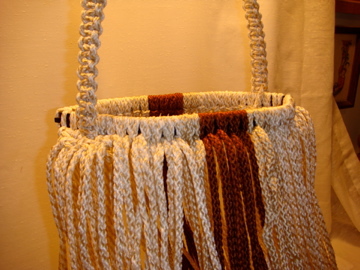 I like to knot purses from a hanging position when possible. So I make the shoulder strap the length that I want it to be. I leave about 5 inches of loose cord on both ends of the strap. 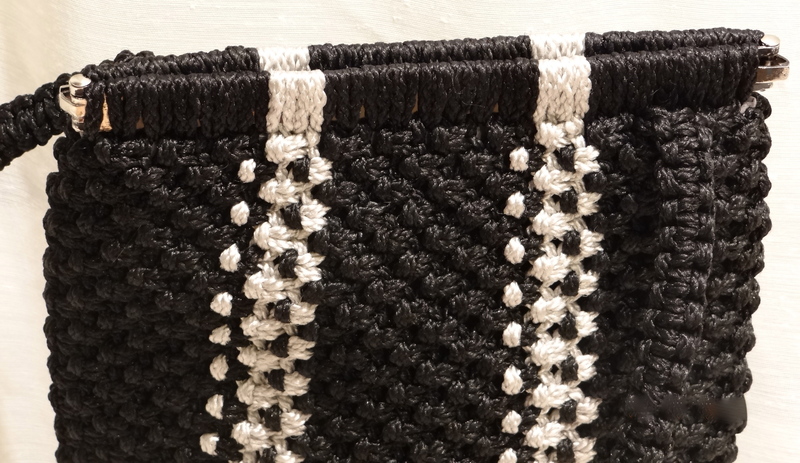 I return to the frame with the cords attached and tie the first three square knots on the left side of the frame starting with cord number through four; this I do on both sides. 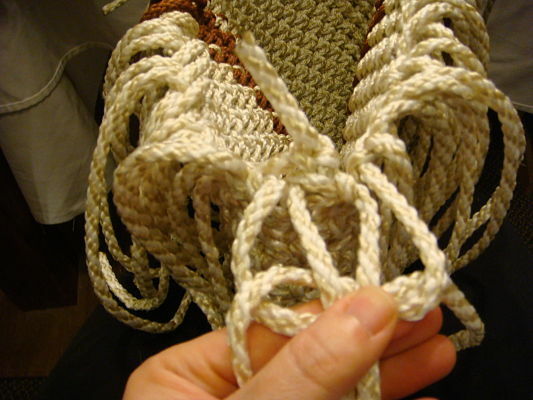 Make sure the knots are tightly knotted against the frame. 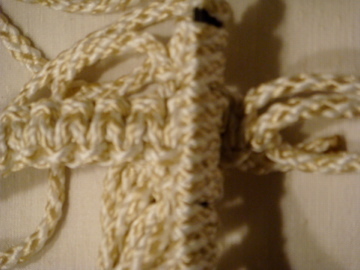 I tie alternating square knots under the three, starting with cord three. You will notice that the second knot on the top row has a supporting knot on each side and bottom. 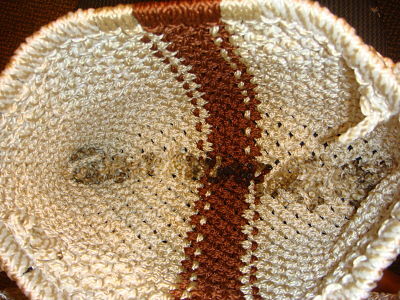 Remember this is done on both sides of the purse on the left sides. If you open the frame looking down at the top, you will see work started on opposite corners. Now the focus will be on that second surrounded knot. 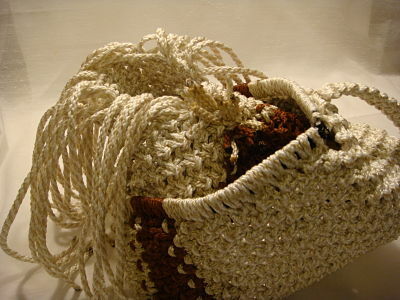 You will insert the four loose strap cords from the outside toward the inside of the purse. The first two cords on one side and the second two on the other side of the second knot with the cords. 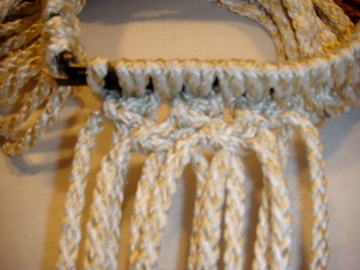 Tie two very tight square knots on the inside of the purse. Making sure the strap is not twisted, tie the other end of the strap around the opposite side’s second knot. 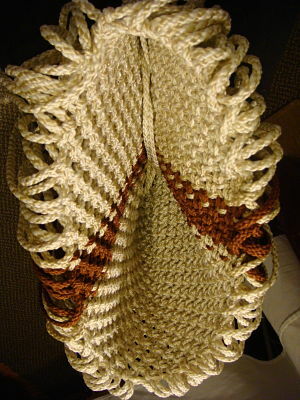 Now you have a handle to hang the purse as you work on the rest of the body. 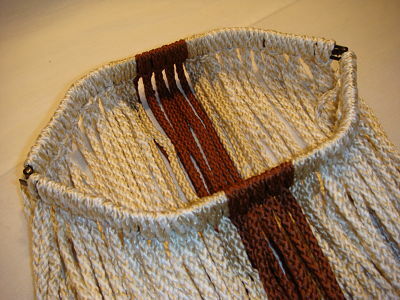 When you have used most of the cords to produce the purse and the desired length is complete, the bottom will need to be closed. 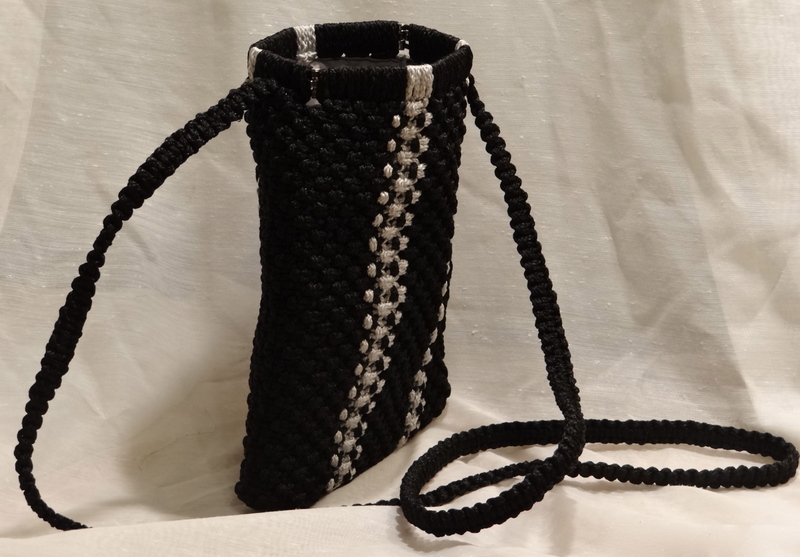 With a purse made entirely from cord, without a metal frame or wooden handle, you are able to easily turn the entire project inside out to close and secure the bottom and return it back. But as mentioned before the frame opening does not always allow for this. 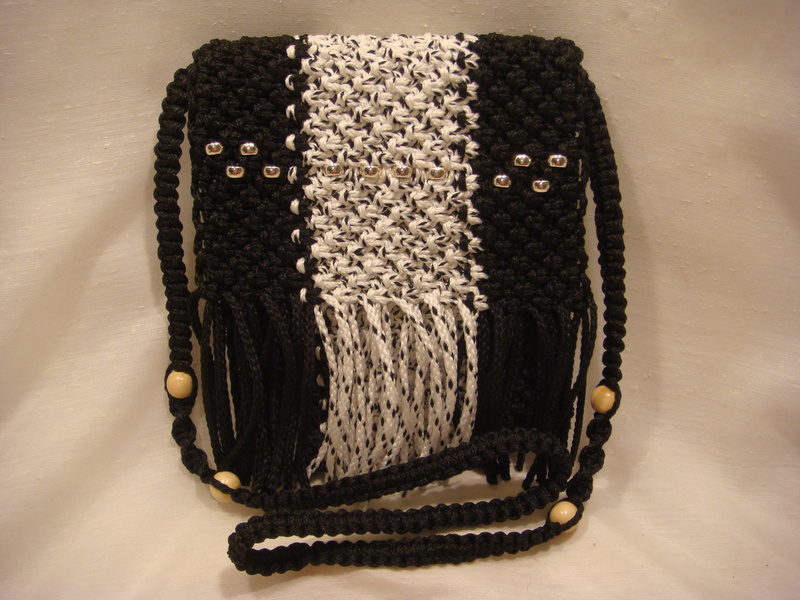 I have decided to tie the closing knots with the purse right side out. 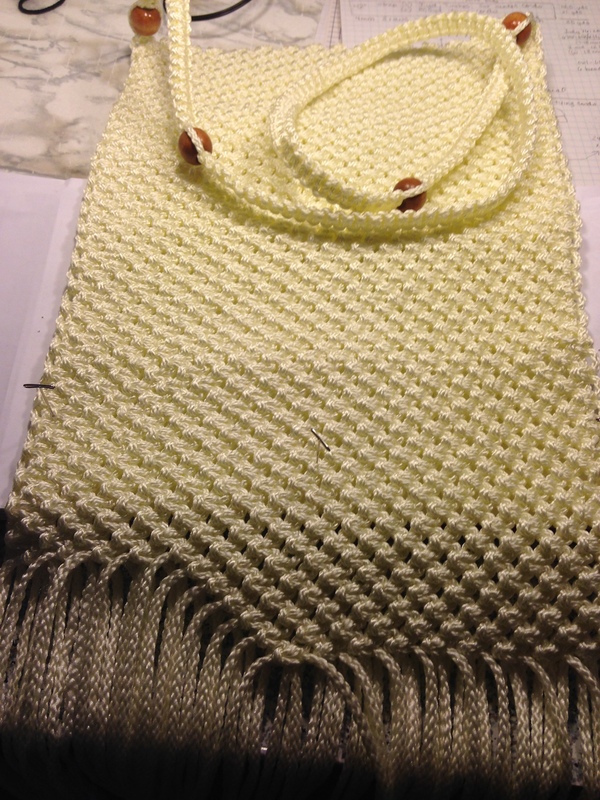 As I finish a knot, I cut he long ends short, melt the ends to stop fraying and turn the knot to the inside and continue like this until the last 4-6 inches. It is easier to have a constant flame for this method. 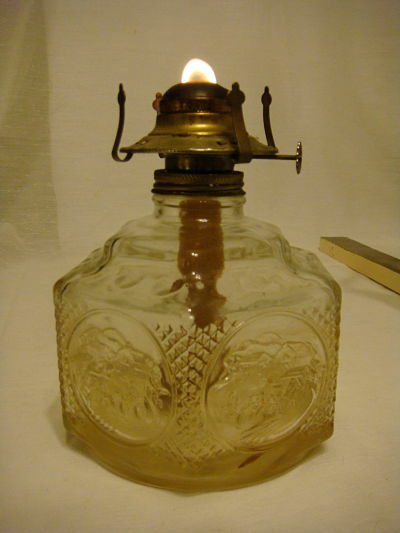 I use a hurricane lamp without the chimney set at a very low flame. Some may think this is a stinky way, but I have found paraffin lamp oil that does not make me nauseous from the kerosine smell. You can use a candle if you wish. 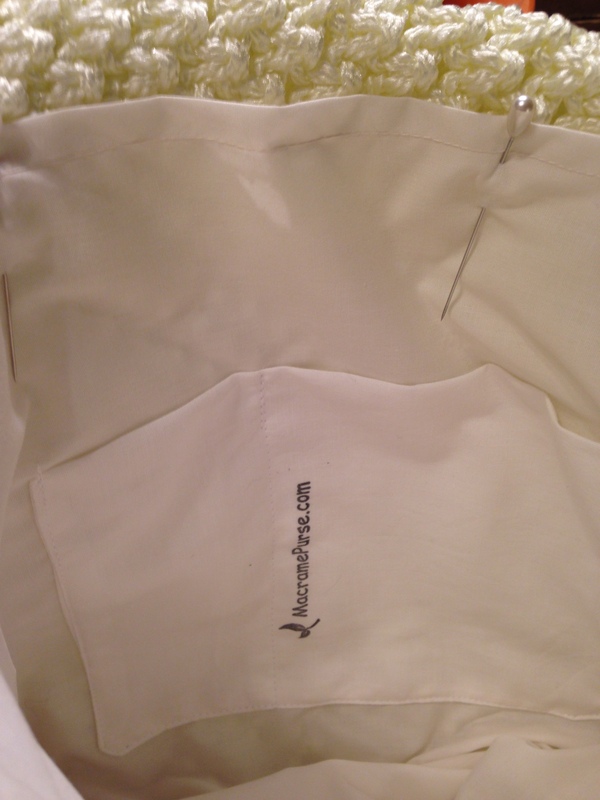 I keep the purse right side out and find the outside 2 edge cords on one side. Place the purse between your knees letting the cords to part to either side. Take the first two edge cords and tie two tight over hand knots. Cut the cords about an 1 1/2- 2 inches and melt the ends. 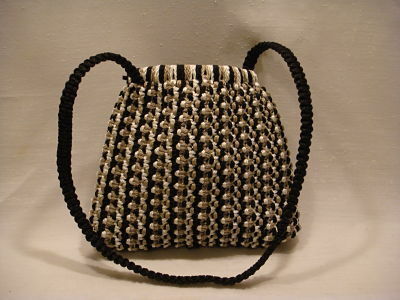 Turn that knot to the inside of the purse. 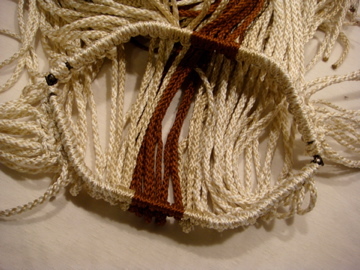 Take two cords from each side; the first on each side will be the center cords and the next will be the tying cords. 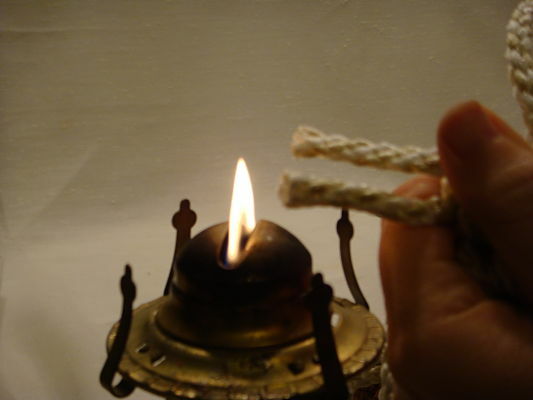 Tie a tight square knot and cut the ends like the previous, melt and turn these to the inside as well. 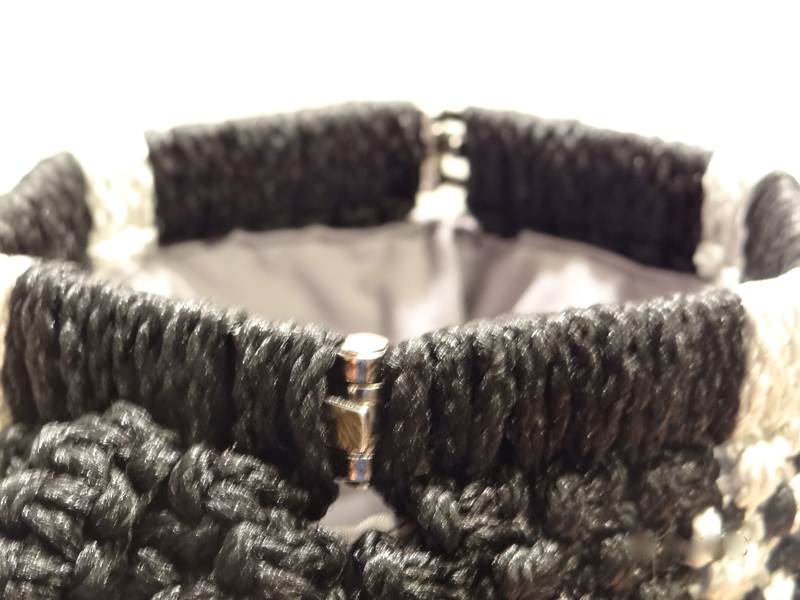 Make sure you grab the next set of cords that make the square knot each time. If you do not, you will end up leaving cords out of the tie off and you will not end evenly with two cords at the end. 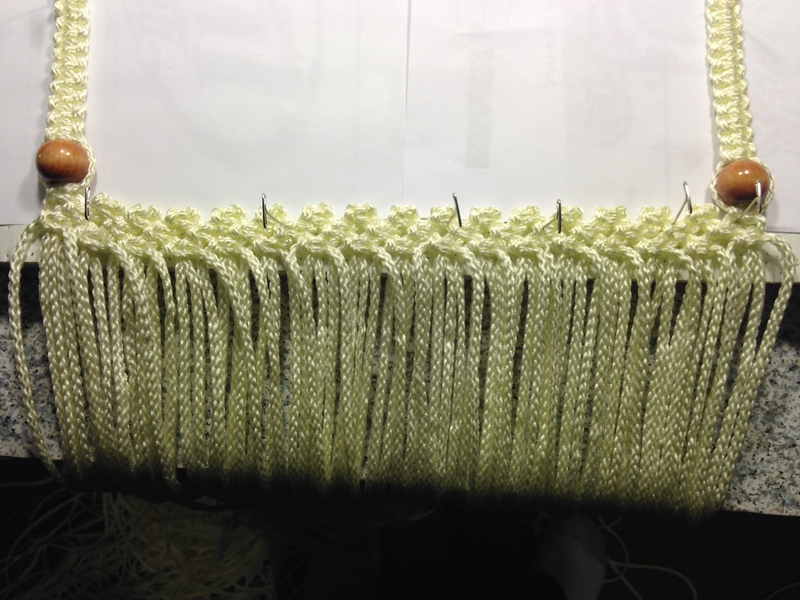 You should notice that the closing knots will resemble alternating knots, closing the gaps from the previous row. This makes a tight closure. When you get to the last 4 inches, you will need to push the unfinished corner out through the opening as if turning inside out. Finish the square knots to the end, then clip and melt the ends. Push it back through the opening for finished work. 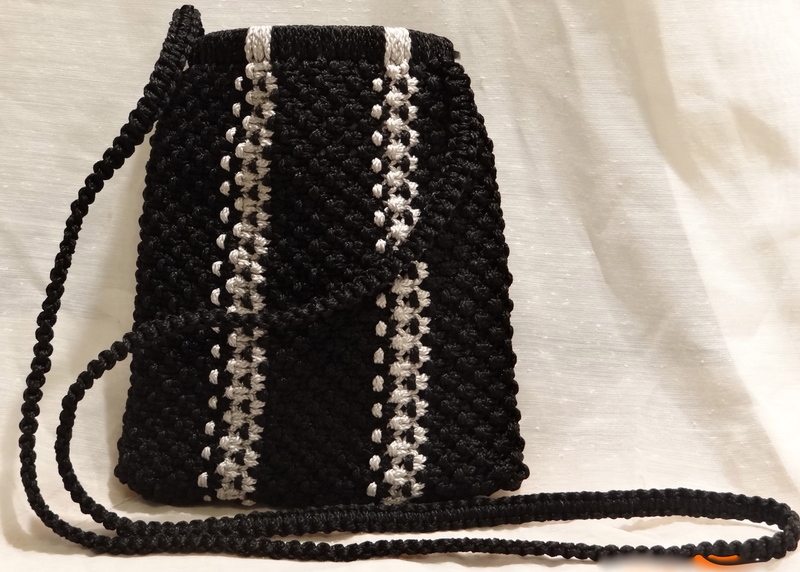 Here is the finished purse ready to be lined. The inside is big and roomy. 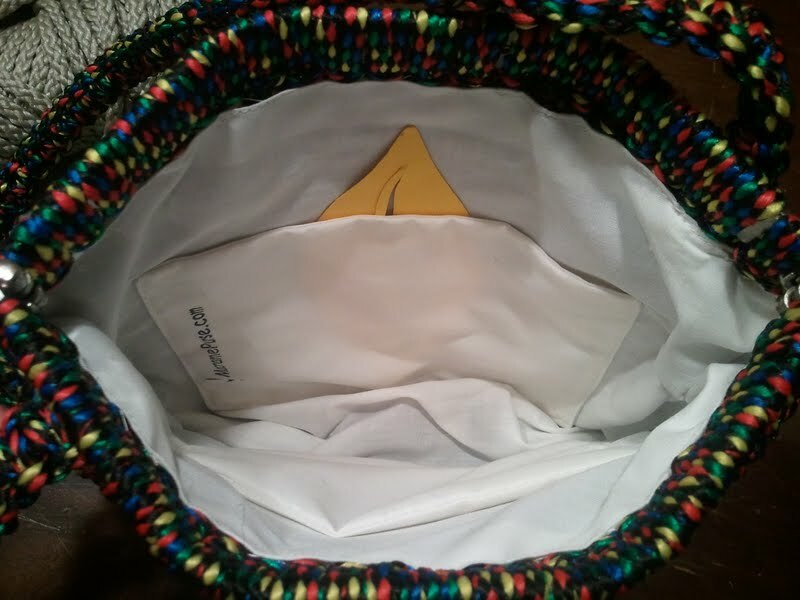 There is plenty of space for your liner to have 4-6 deep pocket on the sides. 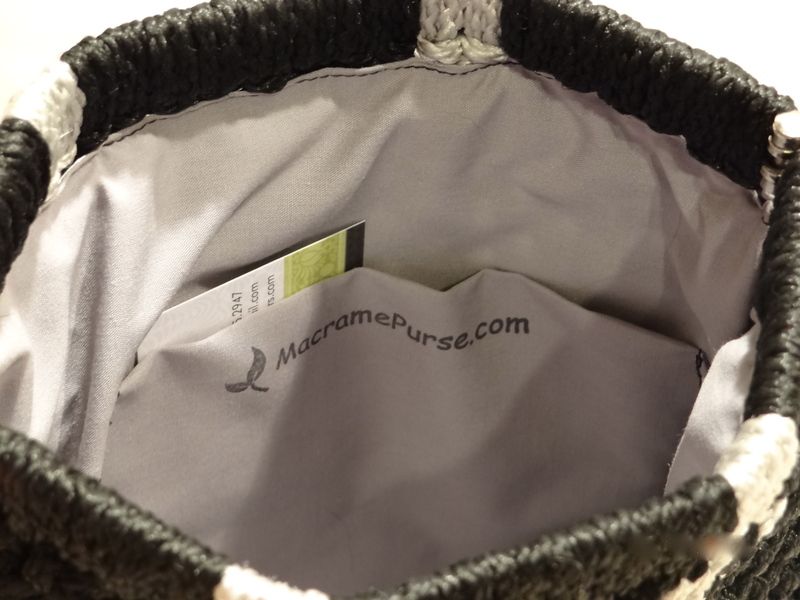 These directions can be used to for any size flex frame purse. 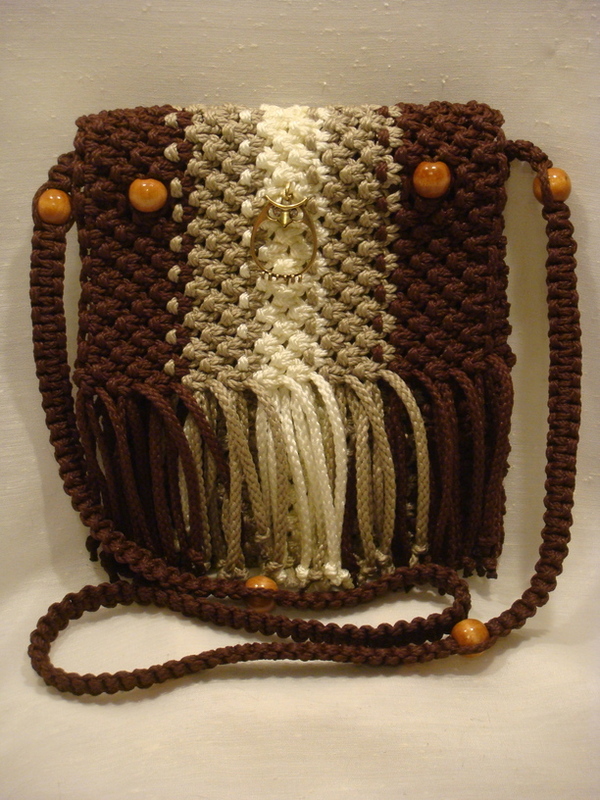 The finished size of this macrame purse is 14″ opening and 16″ width at the bottom with a 12.5″ length. If you have any questions or comments, please feel free to add them here. 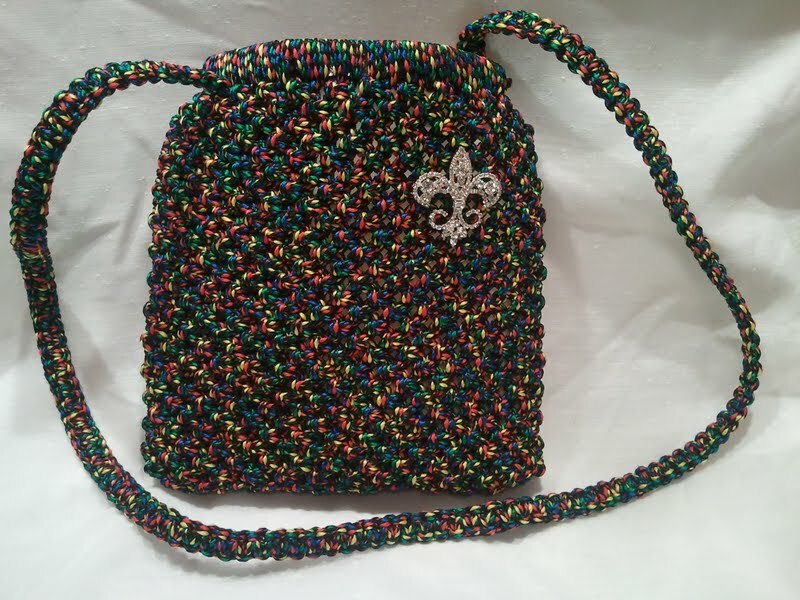 If you are interested in a purse like this, visit the shop tab at the top of this page. 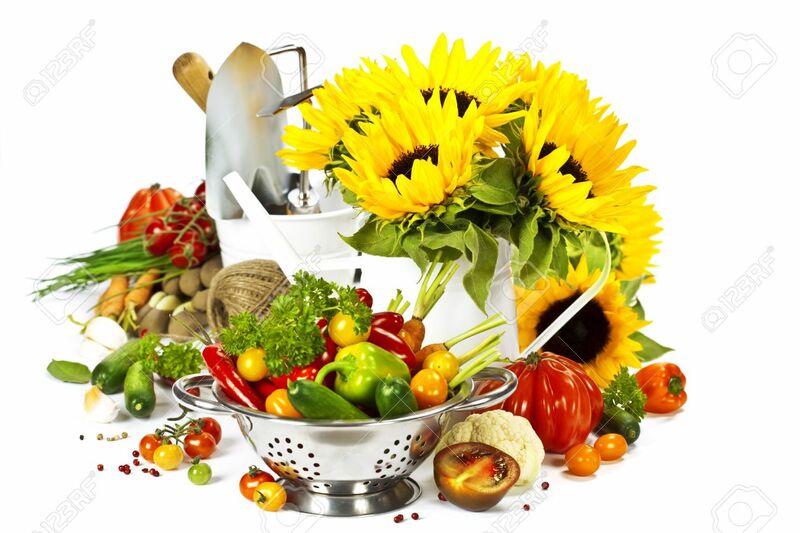 If you would like something made special, please contact me.